Ousmane Dembele’s €105 million transfer now has no way of paying off until the beginning of 2018 as he is expected to miss up to four months with a torn hamstring suffered early on in Saturday’s win at Getafe. 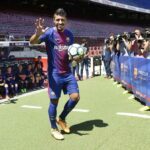 Barcelona will now look to a pair of 23-year-olds who have returned to the club for a mere €15.5 million combined thanks to their comparatively cheap buyback clauses. After a dramatic offseason that saw the 20-year-old French forward sit out at Borussia Dortmund while demanding to be dealt to La Blaugrana, the absence of the versatile talent who was taking over for Neymar leaves Barcelona in a giant predicament while it tries to stay on schedule in La Liga and Champions League. First-year manager Ernesto Valverde said during a Monday press conference that the team’s existing options will have to step up alongside Lionel Messi and Luis Suárez. Valverde continued by listing the players he could move up like Andre Gomes, Aleix Vidal, Denis Suárez and Gerard Deulofeu. The latter two played huge parts in Barcelona’s 2-1 league victory after Dembele’s early exit. It was Deulofeu who did well to steal the ball from Getafe near the corner of the home team’s goal, which led quickly to Denis Suárez’s equalizer. At just 23 years old, Deulofeu has already been somewhat of a journeyman and came back to Barcelona over this summer after Everton loaned him to AC Milan, where he scored four times in 18 total games. The good news is that the decorated youth player has always looked most comfortable as a left winger and has shown before that he can cut well into open space and finish. Also great as a dribbler, Deulofeu shares a bit of the same DNA as Neymar in that regard. The major concern, of course, is that four months may be too long of a time to steadily rely on the young Spaniard who has shown to be inconsistent so far in his young career. That’s not unique among young players, but it is why Valverde will probably need at least Denis Suárez to also move up from the midfield in situational spots. Denis, who recorded a goal and assist in Barcelona’s 6-1 dismantling of Eibar Tuesday, spent much of his prior career with Celta and Manchester City. Now forced into a spot where he now needs to consistently contribute sooner than expected, Denis could become something of a revelation as a playmaker and key complement next to Messi. Where the Dembele injury most hurts Barcelona is the fact that he was just getting into rhythm upon his transition from Borussia Dortmund. After just his third game, he is missing valuable time to develop a chemistry on the attack with Messi and Luis Suárez. Though Messi has started out the season in his normally super-human form, scoring four goals in Tuesday’s rout, his Uruguayan sidekick has yet to make much impact so far. Even still, Barcelona as a whole has impressed without Neymar as it drubbed Juventus 3-0 last week in its Champions League opener and has managed a perfect score in five Liga matches. The path, however, is muddled without the multi-faceted Dembele to take pressure off Barcelona’s other superstars. 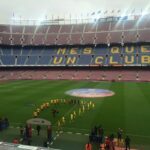 Both Deulofeu and Denis Suárez started in Tuesday’s win against Eibar at Camp Nou, where we caught a good glimpse of life without Dembele. If any club is capable of weathering a key injury, Barcelona is one of them, but the pressure is now on the pair of young Spaniards keep La Blaugrana on track in the meantime.